Mon 15:00 Five drivers remain in the hunt for the big prize as Formula 1 jets off out of Europe for a quintet of flyaway races to determine who will become the 2010 world champion. 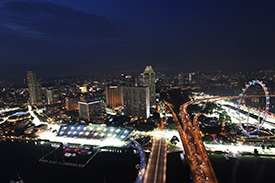 The hot and humid city-state of Singapore hosts its third night race this weekend, with Fernando Alonso and Lewis Hamilton - previous winners here - hoping for a repeat performance, as the battle to catch Mark Webber in the drivers standings hots up. Weather-wise, Singapore is coming towards the end of the second of two wet seasons - the south-east monsoon. So far this month, rain has featured on 14 of the 20 days but, critically, it has only rained four times after six o'clock - the time that Formula 1 cars will be on the circuit. Over the last two weeks, rain has only once arrived during the scheduled Formula 1 track times and today's mathematical forecast models predict that we will see a continuation of dry evenings over the next week. CAPE (Convective Available Potential Energy) values are expected to decrease over the coming days, giving rise to dry and humid conditions during practice, qualifying and the 61-lap race. Light rain and the occasional rumble of thunder is likely during the mornings and early afternoons, but dry conditions should prevail for the important bits, with a maximum temperature in the daytime of 32 degrees Celsius, dropping to around 29 degrees towards the end of each evening. As the circuit lies just 400 km south-east of Kuala Lumpur and the Sepang International Circuit, high humidity is to be expected at between 65 and 80 per cent most of the time. We will continue to monitor the data over the coming days, with a scheduled update on Thursday afternoon. This, of course, will be superseded by further updates if a big storm occurs in the meantime. Thu 16:09 The battle for the title hots up at Singapore this weekend and, with the stakes raised, so the mind games between the five combatants intensified in the media on Thursday. Strong words in the press will need to be matched by quick laps in practice at the Marina Bay circuit, as the drivers roar through the city streets while trying to find the best set-up for Sunday's race. Many are becoming concerned about the prospect of rain during track activity over the next three evenings, and the drivers had much to say on the subject ahead of Friday's first session. Historical data, CAPE values and nowcasting take over in the forecasts rather than the standard predictive charts, given the equatorial climate in Singapore and the subsequent development, deluge and disappearance of rain storms. Several sharp showers have occurred at the Marina Bay circuit since our original forecast on Monday. Tuesday remained completely dry, but on Wednesday a torrential downpour soaked the circuit during the late stages of the afternoon between 16:30 and 17:45. The storm cleared to the south-west into the Singapore Strait, but the circuit was still very wet at 18:00 - the scheduled start time for practice on Friday. Many media representatives had just arrived in the city-state when this storm occurred, prompting widespread concern over the prospect of evening showers this weekend. The fact remains at the time it hadn't rained in Singapore for over two days, and this shower merely pushed up the tally of damp evenings to five in the space of 22 days in September. Today, further showers passed over southern Singapore between 12:00 and 17:30 local time. The last of these showers was extremely light, depositing only a few drops. However, the track surface was still wet at 18:00. CAPE values have leveled out over the last 24 hours and are expected to remain at similar over the next three days. This, of course, means that thundery late morning and afternoon showers are likely, but again it is important to stress that the prospect of an evening shower or storm is minimal. Friday is expected to start dry with some bright sunshine around, but we do expect a risk of showers between 11:00 and 15:00. The chances of rain will then decrease through the late afternoon and evening hours, but as we saw today there is a chance that the first practice session could begin with damp circuit conditions from earlier rain. All eyes will be on the sky tomorrow afternoon, but the likelihood is that we will see two dry practice sessions. Air temperature will peak at the standard 31 or 32 degrees in the heat of the afternoon, dropping slightly to around 29 Celsius by the end of second practice at 23:00 local time. The drivers have spent several days preparing for the heat and humidity, but now it is time to deliver. 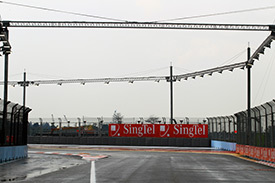 Who will be fastest in the first practice session as the teams and drivers get to grips with the Marina Bay circuit? Join us for full coverage of Friday's action, starting at 09:45 GMT. Fri 16:37 Heavy mid-afternoon showers had some impact on the early practice running at Marina Bay, but Red Bull's dominance on the track will have much more of an effect on the rest of the field after a stunning display on Friday. Weather conditions tonight are dry and clear in the city-state and it should remain this way for several hours, with temperatures dropping to around 25 Celsius in the small hours. CAPE values are expected to drop sharply tomorrow afternoon, but between dawn and midday there is a high risk of a thundery downpour or two. If anything, the threat will be much earlier in the day - and the forecast at the time of writing is for there to be no threat of rain whatsoever during the late afternoon and evening hours. The volatile equatorial climate can of course change quickly and we will be carefully monitoring the data over the coming hours, but at this stage a shower affecting Saturday's running is highly unlikely. Extreme heat and high humidity will be ever-present with a maximum air temperature of 32 degrees Celsius prior to Formula One running, dropping to a minimum of 29 Celsius towards the end of the qualifying session. Will Sebastian Vettel cement his solid Friday performance in final practice? 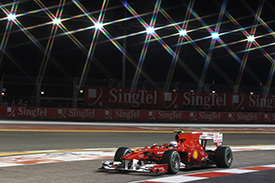 Join us at 10:45 GMT for all the action as the Singapore Grand Prix weekend continues. Sat 17:58 Persistent early-afternoon rain did its best to affect track conditions on Saturday, leaving tricky damp patches in final practice, but no-one could stop Fernando Alonso from claiming a superb pole position for tomorrow night's Singapore Grand Prix. Weather conditions have remained fine, but humid, since the end of the knockout session, with no rain anywhere in the city-state. The period of calm weather is expected to last well into the Sunday morning, before we move into the standard 'rain zone' between 11:00 and 14:00. Convective energy figures will rise throughout the late morning and into the afternoon, but precipitation forecasts released in the last two hours suggest that the standard downpour will be of similar intensity or perhaps even less than we saw today. There is expected to be a reasonable amount of cloud cover - never dropping below 60 percent between now and the end of the race - which may lead many to believe that a shower is imminent. But, despite the cloud cover, it is almost certain to remain dry through the evening, with the afternoon rain slowly drying from the circuit. Temperatures may be a degree or two lower tomorrow, with a maximum in the heat of the afternoon of 31 Celsius, dipping to 28 degrees during the race itself. Who will fare best out of the five championship contenders in the heat and humidity of Singapore? Join us for all the race day action, starting at 10:30 GMT.